Happy Halloween from BBTS! Here is a quick update about a wide variety of new arrivals and more new preorders. Gentle Giant has announced their Premier Guild distribution plans for the Forbidden Planet Exclusive Galactic Marine MB and Coruscant Guard Maquette. The Galactic Marine will go on sale on Nov. 21st, and the Coruscant Guard Maquette will go on sale sometime in December. More details will be released as the order dates get closer. Sideshow Collectibles - PF Slave Leia On Sale Now! As if the 12" Han in Carbonite wasn't enough, Sideshow now has up for pre-order a 1/4 scale Slave Leia! Click here for the exclusive version, and here for the regular version! The Exclusive version also comes with a Salacious Crumb companion piece! It's been a long time coming, but Sideshow Collectibles is finally adding another accessory to the Jabba the Hutt Throne Room environment: Han Solo in Carbonite! Check out the sneak preview here! This piece will go on sale in an upcoming Newsletter, so stay tuned! Droidekas, or destroyer droids, are more dangerous and harder to stop than battle droids or super battle droids. Armed with twin blasters and programmed to destroy, they can surround themselves with a protective energy shield or curl into balls and roll into attack at great speed. Check out the 30th Anniversary Collection version of this cool droid! Forbidden Planet Gentle Giant Exclusives Available Online! Forbidden Planet has the two Gentle Giant exclusives availale directly from their Web site. Click here for the Galactic Marine and here for the Senate Guard. Get them before they are gone! Padmé Amidala, in her fireside dress from AOTC, is the latest update as we come closer to finishing off the TAC basic figure line. Here are two more Toys "R" Us exclusive vehicles sporting the new "Clone Wars Variant" colors. Each vehicle comes with a repacked figure. Extra clones are always nice, but why Grievous instead of an army building battle droid? Hasbro has their 7th Official Q&A posted. Swing by to see if there is anything you missed from the Oct. 24th Web-wide Q&A. There are a lot of abbreviations associated with Star Wars collecting. Heck, any collecting for that matter. The abbreviations that collectors encounter can be a challenge if you don't know what they mean. There are not a lot of sources to help learn them. In most cases, if an explanation of the abbreviations exists on a site it can be hard to find and the list is not right with you when you see an abbreviation you don't know. MOC, MISB, ARC, ODST? These abbreviations in the product listing can be real important in choosing what you want and getting the right item. Hurry up and get your FX Lightsaber soon before Halloween! They make great props for costumes, and you can get one as low as $64.99! GI Joe Wave 6 of the Comic 2-Packs is now in stock, and we expect our Wave 11 and Wave 12 carded figures to ship by October 31st. Also, find reduced prices on select 25th Anniversary GI Joe figures as well as Star Wars Legacy and Clone Wars carded figures. Indiana Jones fans will be delighted to know that 12" Medicom figures of Henry and Indiana Jones are now in stock. Get FREE SHIPPING when you purchase over $100 of in stock merchandise! Check www.brianstoys.com for details and restrictions. eFX has an important update concerning tomorrows Episode II Clone Trooper Helmet sale. Click here to get caught up to speed before you place your order! sale along with a photo-tour of our warehouse. We've got a few Visual Guide holes to fill in our 30th Anniversary Collection basic line, so let's start with a pair of Ewoks: Romba & Graak! Staying with tradition of past DVD releases, Hasbro has a pair of WalMart exclusive DVD Commemorative Sets coming out with the release of the Clone Wars Movie DVD. Click here for all the details! Sideshow - Medicom RAH Clone Commander In Stock! The latest Sideshow Medicom import is now available for order. The Clone Trooper Commander RAH isn't a pre-order, these are in stock and ready to ship! These are limited to just 1,000, so click here to order yours before they are sold out! Autograph Bounty Hunter has a quick update about Collectormania. Click here for the details. 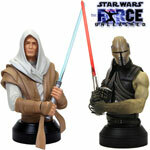 Action Figure Xpress has the exclusive Gentle Giant The Force Unleashed 2-pack ready for pre-order! Head over to place your order, or to check out the brand new images! Red 5 USA is having a sale this week, including reduced shipping costs and other great incentives to help out the Star Wars Collector. We still have plenty of the "Bounty Hunter Series" by Kotobukia available and Thousands of Action Figures available at 25% off. Our selections from Gentle Giant are to numerous to put in this add so stop by and see them all for yourself. We have Attakus Statues Available at reduced costs, Maquettes at unbelievable prices and just about anything else you can think of in the Star Wars family! Stop by, Check us out, and Save some Money! You've seen all the questions and answers, now check out our Headline Report to see the important information to come out of this weeks Q&A session! The Legacy Collection has produced more subsets of figures than any collection to date! There's the basic figures, of course, but there's also the build-a-droid set, the Saga Legends, the 1st Day of Issue set for all the carded collectors out there, and now we have the Greatest Hits set. This very subtle subset consists of figures from the recent past, mixed in with the BAD figures in the same packaging, but with different numbers! Confused yet? To make things even more dicey for die-hard carded collectors, the included droid part changes depending on which wave the GH figures are released with. Don't worry, we've got these straight re-packs broken down in detail as we add this set to the Enhanced Visual Guides! WE ARE LOOKING FOR A FEW GOOD BOARD MEMBERS! The Board of Collectors that is! Are you an avid collector with vast experience and knowledge in a particular line of collectibles? Why not put your skills to work to benefit yourself and other collectors. A new figure confirmed and more Legacy EU on the way... find out all the latest info in this round of Questions & Answers from Hasbro! The latest Autograph Bounty Hunter newsletter is out, with info on FACTS 2008, Collectormania, and Fan Days II. Click here for the full newsletter. Wow! That was fast! We already have an edition size for the sold out exclusive 12" Utapau Clone Trooper: 1,500. Didn't get it? Don't worry, you can still pre-order the regular edition right here. The only thing you will be missing out on is the unique stand. Sideshow also set the edition size of the Diplomatic Mission Diorama to 1,500. Last week we got the first ever Sideshow Collectibles 12" Clone Trooper, and this week it's Medicom's turn with another Episode II clone from the RAH line: Clone Trooper Commander. Check out the sneak peak here. Looking to finally put together a cool Star Wars costume for Halloween this year? Look no further than eBay, where you can find everything from piece-meal parts to full costumes! Our eBay spotlight focuses on the world of Star Wars costuming! If you can't get enough of droids, then the Legacy Collection BAD line is for you! Today we wrap up the Clone Wars wave, which also includes the 4th BAD figure, R7-T1. The next eFX collectible is almost here! Check out the official press release for the AOTC Clone Trooper Helmet, going on sale on Saturday Oct. 25!! Here is a big update from http://www.bigbadtoystore.com about some very exciting new preorders - including tons of new Transformers - and another big batch of new arrivals. The Clones weren't the only ones fighting in the Clone Wars! Check out the Mon Calamari warrior, ready to fight those pesky Quarren neighbors. Stop by the Legacy Collection Visual Guide for all the Clone Wars figures! The Clone Wars are everywhere! And if you can't get enough, then stop by and check out the Web comic, featuring a very cool interactive comic book with stories that compliment each new episode! Check in with the latest eFX newsletter! It's full of information on the upcoming (and slightly postponed to Oct. 25th) Episode II Clone Trooper Helmet, the Studio Scale X-Wing, a special Ahsoka Tano lightsaber, and more! Check it all out here! Plenty of great products highlight our newsletter this week! We've received the new G.I. Joe Artic and Desert Assault Cobra Packs and they are shipping now to all those who have placed their pre-orders. Interactive R2-D2, Disturbance at Lar's Homestead Battle Pack, and Mighty Muggs Wave 4 are new this week for Star Wars! Also, the Luke Skywalker (Ep. 4) FX Saber is back in stock! Check out the new Halo Series 3 figures now available at Brian's Toys! For more of a great selection, head on over to www.brianstoys.com! Today we kick off the second half of Wave 2, the Clone Wars wave, from the Legacy Collection. First up is the Jedi Master Saesee Tiin, and the start of another build-a-figure droid. Check out the guide below for details, as well as another droid factory parts catalog for R7-T1. You, the collectors, have spoken, and we at THE COLLECTORATE have listened! For the past several weeks, fellow collectors have been asking us questions and making suggestions. We have been listening and learning! Many Halo Collectors in particular told us that they generally open their figures after purchase. And some Star Wars Collectors told us they were “Army Builders” who also open their figures. However, we also heard from other Star Wars collectors who really liked the idea of their action figures coming with and being shipped in a protective plastic case (See Preview Article #4 on our Splash Page). Why not have it both ways? Last week Sideshow announced which clone trooper would be the first clone offered in the 12" scale. Now is your chance to order it! Stop by and place your pre-order for the 212th Attack Battalion Utapau Clone Trooper Exclusive or Regular Edition Before they are GONE! KSWCC is hosting its annual Fall Festival on Oct. 18. If you live in or are going to be near the Kentucky area at that time, then read on for all the details on this great Star Wars party! Take a look at the 3rd series of Kotobukiya Clone Wars figures: The Sith! Featuring Count Dooku, Asajj Ventress, General Grievous, and the bonus Darth Sidious figure! These are also available for pre-order at StarWarsShop.com. Stop by our repack index to check out the latest updates. We've added over 100 new additions, and there are more to come as we continue to build this ultimate resource for action figure collectors. The latest additions fill in all the repacks from 2005's ROTS line. Autograph Bounty Hunter has more information on FACTS 2008, as well as Fan Days II and a private signing. Get all the updates in the latest ABH Newsletter! Red 5 USA is determined to bring you the products you want at prices that don't require a government bail out for your bank account! Just this week alone without the help of Congress we bring you the Gentle Giant Maquette line at unheard of prices. These Statues are a sight to behold if you haven't seen them yet and at the pricing levels we've set you can't afford to miss out on these beauties. We've got them all in stock and even more for you to pre-order so be sure to give them a look. Also Asajj Ventriss / Count Dooku Statue by Gentle Giant is a Master piece, the Red and Blue Guards are priced to move and we have a nice stock of Fine Attakus products for your viewing pleasure. If you haven't seen the Attakus Sergeant "Limited Edition" we suggest you take a good look at him. Only 750 copies were produced and you will not find a finer example of the Tatooine Sandtroopers anywhere in our Galaxy. If you haven't been by Red 5 Collectibles in awhile, you owe it to your Star Wars Collection to stop by and say Hello! As always total satisfaction is our guarantee. The new Clone Wars series kicked off with a bang on Friday night! To follow up the premiere, Lucasfilm also launched a massive digital distribution campaing, which includes the latest episodes available from iTunes, podcast commentaries, and more! Read all about it here! The new, exclusive GI Joe Cobra Assault packs are almost here and will be shipping by October 8th! Get your pre-order in today. New this week Brian's Toys has the Indiana Jones Mini-Bust, a life-size Boba Fett statue, as well as the latest Wave 10 carded figures from GI Joe! We've also added plenty of Modern AFA figures and Vintage ungraded figures. For more of a great selection, check out www.brianstoys.com! Here is a big update from http://www.bigbadtoystore.com about a ton of new preorders from Hasbro and others, and a wide variety of new arrivals! We have been in “can’t wait” mode since April! Last week we signed a contract with a national design firm to take over the creation of our site. HoloNet News Is Back! With all New Audio News! HoloNet news is back! But now instead of reading the news, you get to hear it! Check out the all new audio HoloNet news! This cool new audio drama will be a great addition to the Clone Wars series! Sideshow Collectibles - Let the 12'' Cloning Begin! They said it was coming, and here it is! The first Sideshow 12" Clone! None other than the 212th Attack Battalion Utapau Clone Trooper! Let the cloning begin! Click here for a sneak preview! The 2008 Gentle Giant Premier Guild gifts are right around the corner, so how about an Enhanced Visual Guide look at one of the items that was packed in the 2007 Premier kit: the AOTC Clone Trooper Sergeant Bust-up. You can also check out the rest of his clone comrads over in the Gentle Giant Visual Guide! Looking for a stylish way to display your Force FX Lightsabers? Make sure to stop by and check out Saber-Stand.com. Vertical storage is the only way to insure the blade does not warp. Protect your investment!